September 29, 2015  Standards & Practices Editor Mark Memmott writes occasional notes about the issues journalists encounter and the way NPR handles them. They often expand on topics covered in the Ethics Handbook. September 19, 2015  Does it grate on your ears if you're offered a "free gift?" Would you have a "sudden impulse" to correct that grammar? 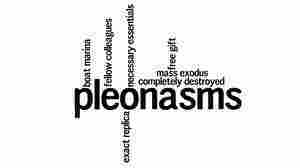 Pleonasms have unnecessary, superfluous words. Tell us about the ones you hear. September 15, 2015  Standards & Practices Editor Mark Memmott writes occasional notes about the issues journalists encounter and the way NPR handles them. They often expand on topics covered in the Ethics Handbook. 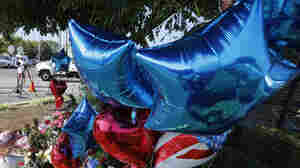 September 11, 2015  Standards & Practices Editor Mark Memmott writes occasional notes about the issues journalists encounter and the way NPR handles them. They often expand on topics covered in the Ethics Handbook. August 29, 2015  Here's how NPR thought through whether the gunshots that killed two TV journalists should be replayed on the radio and online. August 19, 2015  Standards & Practices Editor Mark Memmott writes occasional notes about the issues journalists encounter and the way NPR handles them. They often expand on topics covered in the Ethics Handbook. August 18, 2015  Standards & Practices Editor Mark Memmott writes occasional notes about the issues journalists encounter and the way NPR handles them. They often expand on topics covered in the Ethics Handbook. August 11, 2015  Standards & Practices Editor Mark Memmott writes occasional notes about the issues journalists encounter and the way NPR handles them. They often expand on topics covered in the Ethics Handbook. August 4, 2015  Standards & Practices Editor Mark Memmott writes occasional notes about the issues journalists encounter and the way NPR handles them. They often expand on topics covered in the Ethics Handbook. August 3, 2015  Hasan Minaj praises the editing skills of Jon Stewart, who pushed his team to cut out " extraneous stuff, even if it's extra laughs."